Angina pectoris symptoms include a feeling of squeezing or pressure in the chest; nausea; pain in back, jaw, neck, arms, or shoulders; discomfort that resembles indigestion; shortness of breath; tiredness; weakness; light-headedness; sweating.. Angina pectoris is also known as ischemic heart disease and congestive heart failure. Over time plaque, a fatty substance, can build up inside coronary arteries. The plaque makes the blood vessels narrow and stiff. As a result, less blood is able to get to the heart muscle. The heart can’t move the blood to the rest of the body efficiently. For some people lifestyle changes and medication can control angina. Others may require angioplasty or the placement of a coronary stent to keep the artery open. The most extreme treatment is coronary artery bypass graft surgery. Angina pectoris symptoms vary depending on the type of angina, as does the treatment. Symptoms that occur only when the heart has to work more intensely than usual is called stable angina. Medication is helpful. Unstable angina pectoris symptoms occur suddenly, whether or not there is physical exertion, and can signal in imminent heart attack. Medication does not resolve this type of angina. A coronary artery spasm causes variant angina. This is a temporary reduction in blood flow to the heart. Medication is helpful. These three types of angina affect men and women equally. 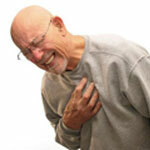 Angina affects about 70 million Americans. The fourth type of angina, microvascular angina, lasts longer than other types. It affects the smallest blood vessels rather than major arteries. The symptoms are more severe than in the other three types. 7 out of 10 microvascular angina patients are women. It develops most often in conjunction with menopause. Angina pectoris symptoms should be taken seriously because they can herald a heart attack and are indications of serious underlying medical conditions. If you have these symptoms, do not wait, call your doctor.